It was 11/11/11, and with prophecies of both gloom and doom and enlightenment casting about, I opted for the spiritual enlightenment and headed for the Myakka River in Sarasota. The Myakka River is a brown water river that originates in Manatee County and travels southwest to eventually empty into the Gulf, a 66-mile journey. In 1985, Florida designated 34 miles of the Myakka a “Wild and Scenic River;” 14 of these miles pass through the Myakka River State Park, one of the more desirable and easily -accessed locations for kayaking and canoeing (Huff). I arrived at the outpost in the Myakka State Park on this windy, chilly morning only to be told by RJ that they weren’t renting kayaks due to the weather. You see, from this point on the south end of the Upper Myakka Lake, one would paddle south a few miles –with the current—and return north—against the current—and on this morning, against the wind. In the end, I was able to convince RJ to rent me a kayak—knowing that I would pay an extra fee if he had to come get me. Shortly after putting and beginning my paddle south, I portaged around a dam at the end of the lake. I thought RJ had told me to portage right, but apparently, I thought wrong. To the right was “Gatorland”—seven or eight gators sunning on the river bank, surrounded by 30 or more vultures. So, I was up and over to the left and on my way. Tall grasses and low muddy banks flanked me right and left, as I paddled through this marshy, plain-like landscape, so unlike the canopied, winding Alafia and Hillsborough Rivers. Further south, the landscape changed some, as cabbage palms and oaks appeared on one side, offering some shade, and sometimes, a break from the wind. 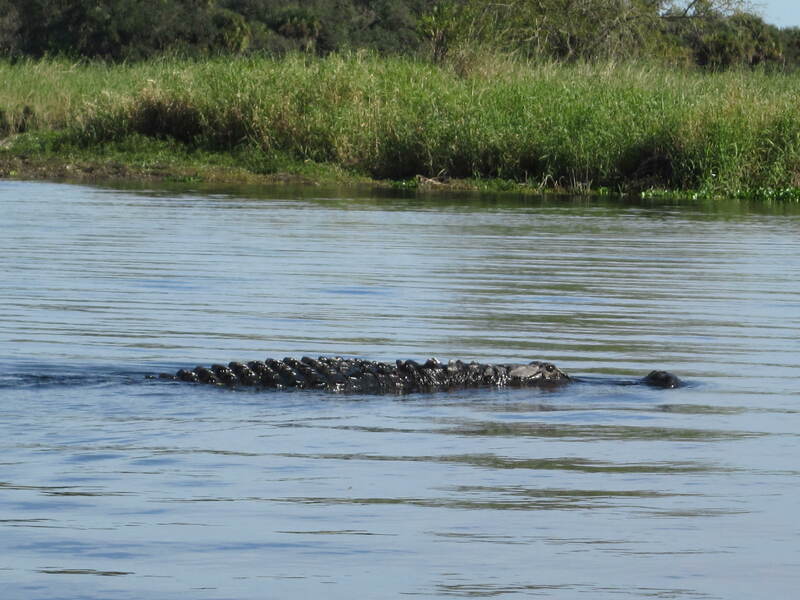 Huff cautions readers about the Myakka gators, no scaredy cats here! These gators were more active and a bit more intimidating than those in other rivers, and when the river narrowed to 10 feet, having gators on both sides of me became…only a little uncomfortable. They seemed curious, and often left the banks and slithered into the water as I neared, coming out to greet me, or so it seemed. However, they always stayed a distance, perhaps swimming parallel to me or crossing in front of me and then disappearing below the surface. feet skipped across the water, a prized fish in his mouth. Some amazed me, such as the great herons that first crouched and then pushed themselves into the air for flight and the large wood storks that somehow managed to look graceful gliding on the thermals. The banks were alive with the “hunk, hunk” of the ibises and the grunting of the roseate spoonbills and about 20 other birds including egrets (snowy, great), red-shouldered hawks, cormorants, anhingas, herons (great blue, great white, little blue, tricolor), wood storks, vultures, ospreys, and the adorable black-necked stilts. I paddled to the first bridge and back…less than six miles. With the wind and the current on my return (and pausing now and then for pictures), it took me four hours. I passed only a few other kayakers along the way and a few gator spectators along the banks, and I walked away with some added serenity. I’d love to return someday. Then, I would put in at SR 72 and paddle south into the park wildness preserve to Lower Myakka Lake and the Deep Hole, a 150-foot deep sinkhole. 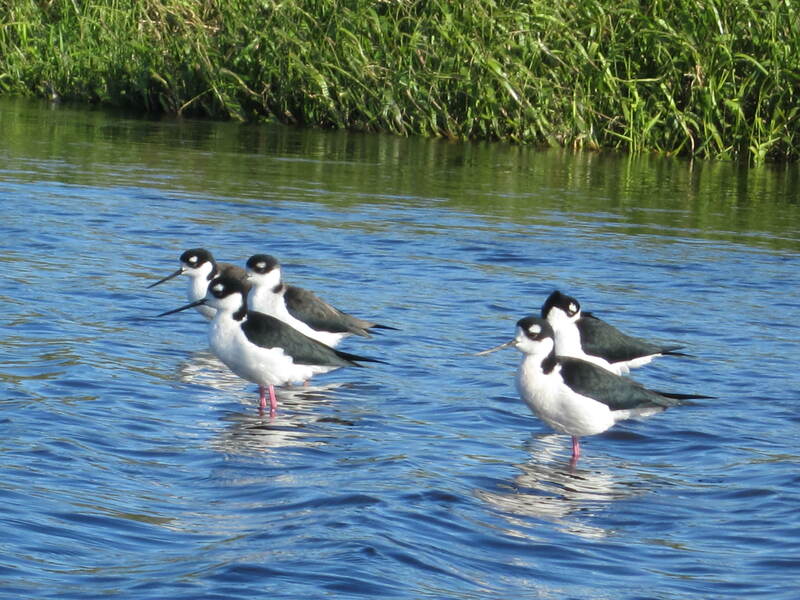 Great job on describing your adventure on the Myakka, Susan ! The wonderful details really made it come alive. Good for you for braving it in the face of uncertain weather—those trips are often the most fun cuz they seem to have lots of unknowns factored into the experience, someone making the reality seem a bit more vivid. Thanks, Bill. It doesn’t take long on the river for the amazement to overcome any weather issues!